Remove the nut and disconnect the stabilizer connecting rod from the stabilizer bar. Remove the front suspension member. Refer to FSU-16, "Removal and Installation". Remove the stabilizer clamp bolts ( ). Inspect the components. Refer to FSU-13, "Inspection". Install the stabilizer bushing with the slit (B) facing toward the front of the vehicle ( ). Install the stabilizer clamp with oblong hole (A) facing toward the front of the vehicle ( ). 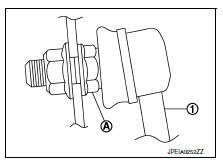 Install the stabilizer clamp bolts in the order of 1 to 5 as shown. To connect the stabilizer connecting rod (1), tighten the nut while holding the hexagonal part (A) on the stabilizer connecting rod. Do not reuse stabilizer connecting rod nuts. Complete the inspection. Refer to FSU-13, "Inspection". Check the stabilizer bar, the stabilizer connecting rods, the stabilizer bushings, and the stabilizer clamps for deformation, cracks or damage. Replace components if necessary.